Banana Bonanza is a Bonus Game that can be found in various levels of DK: Jungle Climber. It is sometimes accessible from Bonus Barrels. The minigame starts with a Barrel roulette. When the player presses the button, the roulette stops on a small, medium, or large Barrel, determining the size used by Donkey Kong. His objective is to collect as many falling Bananas and Banana Bunches into the Barrel as possible within a time limit of ten seconds. 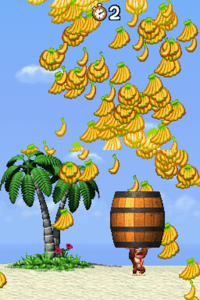 When the minigame ends, Donkey Kong hides in the Barrel, and the number of collected Bananas are revealed as they fly out. Donkey Kong gets an Extra Life for every 100 Bananas that he collected. An Adobe Flash version of this minigame, parsed Banana Bonanza!, was playable on the official DK: Jungle Climber website. The browser version was largely the same as the original minigame, although it did not have a visible time limit. This page was last edited on August 10, 2018, at 10:05.